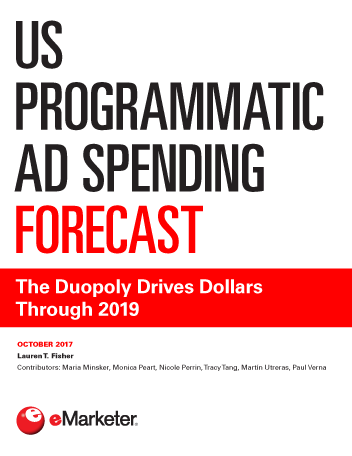 US programmatic digital display ad spending will reach $32.56 billion by year’s end, eMarketer projects. By 2019, more than four in five US digital display ad dollars, or $45.72 billion, will flow via automated means. Continued emphasis on advertising quality and brand safety will accelerate spending in both programmatic direct and private marketplace (PMP) deals. By 2019, the combined share of these two transaction types will be 79.6% of the total programmatic pie. 2017 will be the first year that the growth in open-market spending slips into the single digits. Yet the continued adoption of header bidding will help keep dollars flowing here over the forecast period. Mobile’s share of US programmatic digital display ad outlays will increase, thanks to overall market trends and the continued influence of players like Facebook and Google, which are both mobile- and programmatic-centric. By 2019, nearly 80% of programmatic ad spend will go to mobile—rather than desktop—ads. Programmatic buying of digital video ads will continue to grow, thanks to brands’ rising use of advanced audience buying practices and publishers’ growing acceptance of automation’s role in the sales process. By 2019, 77% of all US digital video ad dollars will move programmatically. "By 2019, 83.6% of US digital display ad dollars will transact programmatically." Did Q1’s Brand Safety Issues Affect Programmatic Buying?